This pre/post test may be used by self-learners or when used as part of a learning curriculum for trainees. Click Here for the Answer Key. Beyond the Pill: research to reduce unintended pregnancy, national provider training program to increase access to IUDs and implants, and free educational tools designed for young women. Bedsider.org: comprehensive birth control information designed for young adults. On Thursday, October 15th, DC AAP hosted the DC Adolescent Health Working Group’s AJ Cooper III Annual Advocacy Symposium. 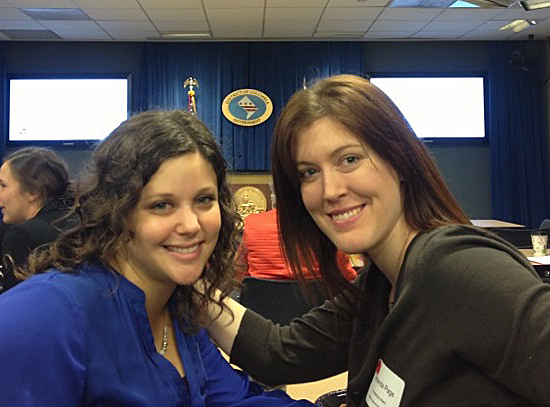 This year’s symposium focused on Reproductive Health Policy. The event was very well-received by over 100 attendees, including medical providers, government staffers, community advocates, and local funders. A who’s who of local and national experts presented on topics including reproductive justice, LARC access and utilization, critical access points for contraceptive care, and challenges for adolescents to receive care (confidentiality & EOBs, Medicaid freedom of choice provisions, and LARC reimbursement). Dr. Anjali Talkwalker, Senior Deputy Director of the Community Health Administration for the DC Department of Health kicked off the day with a presentation on Adolescent Reproductive Health in the District of Columbia. Dr. John Santelli, Chair of the Heilbrunn Department of Population and Family Health at the Mailman School of Public Healthat Columbia University, gave a presentation on School Based Health Centers as a critical access point for contraceptive care . Other speakers included experts and leaders from Unity Health Care, Inc.; Planned Parenthood of Metropolitan Washington; the Healthy Generations Program at Children’s National Medical Center; the Division of General Pediatrics and Adolescent Medicine at Johns Hopkins School of Medicine, the Association of State and Territorial Health Officials, and the National Family Planning and Reproductive Health Association. In the afternoon, attendees broke into small groups to discuss the barriers to reproductive health care in D.C. and to identify actionable items to overcome these challenges. The symposium ended with an opportunity for attendees to interact with a panel of teen Peer Health Educators from the Young Women’s Project and the Latin American Youth Center. The panel was facilitated by The Honorable Yvette Alexander, Chair of the DC Council’s Committee on Health and Human Services. Councilmember Alexander also graciously hosted the symposium at the historic John A. Wilson Building, which houses the Executive Office of the Mayor and the Council of the District of Columbia. On October 30th, 2014 DC AAP’s Adolescent Health Working Group held a city-wide SBHC Summit, bringing together leaders from government agencies, SBHC operators, MCOs and community advocacy organizations to create an action plan for ensuring sustainability and accountability of school based health centers. The conference was funded by the Summit Fund of Washington and hosted by DC Councilmember Yvette Alexander, Chair of the Committee on Health at the John A. Wilson Building. Presenters included Ryan Springer, MPH, Senior Deputy Director, DC Department of Health, Community Health Administration; John Schlitt, President of the School Based Health Alliance; Peggy McManus, MHS, President of the National Alliance to Advance Adolescent Health; and Terri Wright, PhD, MPH, Director of the Center for School, Health and Education in the Division of Public Health Policy and Pratice at the American Public Health Association. and community advocates at the 2014 DC AAP School Based Health Care Summit. The Adolescent Reproductive Health Symposium – a free CME opportunity supported by a grant through the American Academy of Pediatrics DC Chapter – was held Friday, June 13, 2014. Improve your knowledge and comfort with contraception methods and screening of sexually transmitted infections among adolescents. Adolescents in the District of Columbia face a number of challenges that impact their health. Many young people suffer poor health outcomes including early and unwanted pregnancy, HIV and other sexually transmitted infections and mental health disorders. On the other hand, youth in this city also have the benefit of numerous health providers and community organizations dedicated to improving their health. In order to better coordinate the efforts of these diverse youth-serving organizations, the DC AAP established a District-wide Adolescent Health Working Group with financial support from the Summit Fund of Washington DC. 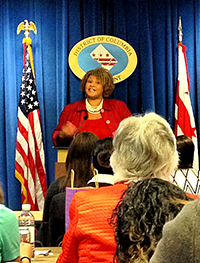 The Honorable Yvette M. Alexander, Chair of the Committee on Health for the DC Council, addresses DC health care professionals and community advocates at the 2013 DC AAP Adolescent Health Advocacy Training Summit. Since its inception in late 2012, the Working Group has expanded to include partners from health care organizations, government, education and non-profit groups. Top priorities for the group include ensuring access to comprehensive sexual and reproductive health services, mandating high quality health education and improving coordination of primary and mental health care. Another top priority of the group is to help train pediatricians to use the understanding they have of adolescent health needs to educate policy makers and advocate in the District on behalf of the youth they serve. The AHWG held a day-long, city-wide Adolescent Health Advocacy Summit in Fall, 2013 designed to train new adolescent health advocates and initiate the creation of an electronic adolescent health advocacy network. The event was hosted at the John A. Wilson Building by the Honorable Yvette M. Alexander, Chair of the Committee on Health of the DC Council. 95 health care professionals and community advocates from all 8 wards, including pediatricians, nurses, nurse practitioners, medical trainees, program administrators, social workers and non-profit leaders were trained on effective advocacy skills related to adolescent and reproductive health. Presenters included the director of the American Academy of Pediatrics, Department of Federal Affairs; the Children’s Budget Consultant for the Office of the Deputy Mayor for Health and Human Services; and the Interim Senior Deputy Director of the HIV/AIDS, Hepatitis, STD & TB Administration, D.C. Department of Health. In addition, the Honorable Yvette M. Alexander, Chair, Committee on Health for the District of Columbia City Council addressed the group, sharing her vision for adolescent health in the District. Attendees ended the day by meeting with eleven of the thirteen DC Council members and/or their staffs to educate them about the importance of primary pregnancy prevention; access to quality health education and increased funding for school based health centers. To be added to the distribution list for future legislative activities or advocacy trainings, please contact Nancy Schoenfeld at nancy.schoenfeld@aapdc.org. 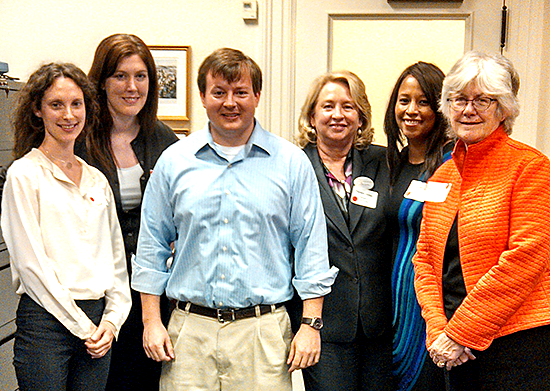 Attendees of the Adolescent Health Advocacy Summit meet with DC Council staff. 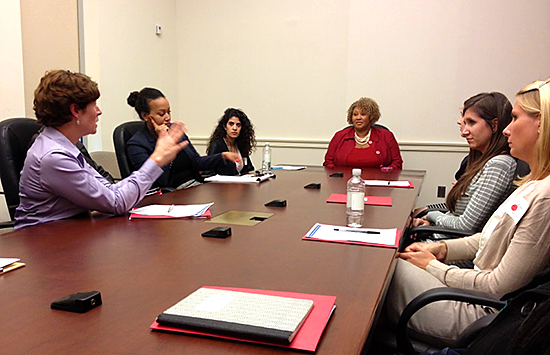 The Honorable Yvette M. Alexander, Chair of the Committee on Health for the DC Council, and Melanie Williamson, Legislative Counsel, meet with Dr. Lee Beers, President of DC AAP, and several attendees of the Adolescent Health Advocacy Training Summit. Children’s National Medical Center pediatric interns Alison Nobil, MD and Amanda Page, MD getting ready for the day!